WASHINGTON — As a potentially catastrophic hurricane heads for the Carolinas, Congress is moving to avert a legislative disaster that could lead to a partial government shutdown just weeks before the November midterm elections. The House is set to vote Thursday on a $147 billion package to fund the Energy Department, veterans’ programs and the legislative branch. Meanwhile lawmakers said they will seek to pass a stopgap funding bill for the rest of the government through Dec. 7. Rep. Rodney Frelinghuysen, R-N.J., chairman of the House Appropriations Committee, said the stopgap measure will be attached to a separate spending bill lawmakers are negotiating to fund the Defense Department and labor, health and education programs. 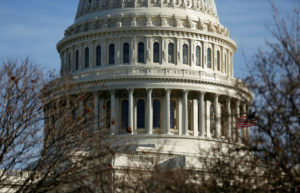 The bill to be approved Thursday is the first of three spending packages Congress hopes to approve this month to avoid a government shutdown when the new budget year begins Oct. 1. It represents a compromise between House and Senate negotiators. Approval of the initial spending bill was so important to Republican leaders that they moved up a vote planned for Thursday, citing the threat of Hurricane Florence bearing down on the Southeast U.S. coast. The storm is expected to make landfall Friday in the Carolinas.